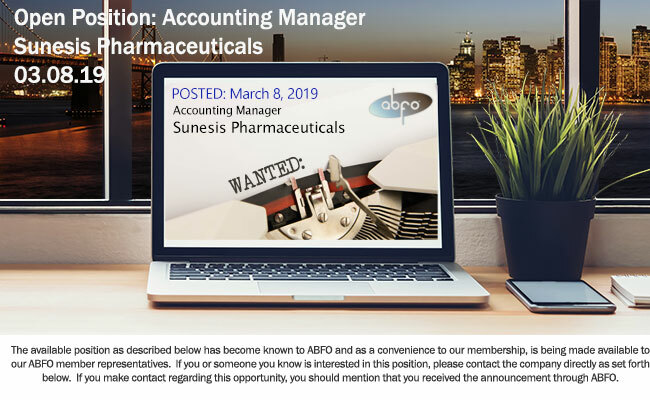 New ABFO Open Job Posting - Accounting Manager - Sunesis Pharmaceuticals, Inc. The Accounting Manager will have accountability for maintaining accounting functions including general ledger responsibilities, accounts payable, accounts receivable as well as other related activities. The Accounting Manager will manage various GL accounts reconciliations, invoicing and the month-end close process. This individual works closely with other members of the Finance Team, operations and external auditors. This position will report to the Executive Director & Corporate Controller. Develop, implement and/or maintain one or more accounting systems. Prepare journal entries; maintains and reconciles general ledger accounts. Provide records of assets, liabilities and other financial transactions. Prepare profit and loss, income and balance sheet statements. Ensure accuracy and compliance with all accounting regulations. Assist in monthly financial close process, which includes preparing accruals, journal entries, account reconciliations and variance analyses. Compile data for monthly and quarterly financial reporting package. Oversee fixed asset management, including asset tracking and reporting. Support the company’s annual audit and special projects as requested. Prepare monthly journal entries, account reconciliations for both routine and complex accounting transactions and balance sheet accounts in accordance with US GAAP and company guidelines. Pay expense reports generated from Concur via payroll. Prepare deliverables with respect to quarter and year-end financial statements and associated tax preparation. Participate in preparation and coordination of the audit process. Engage with the SOX compliance process. Oversee semi-monthly payroll process through ADP. Bachelor’s degree in Accounting with 5+ years of general accounting experience. Biotech industry and clinical accrual accounting experience a plus. Strong Proficiency in MS Excel & MS Word required. Knowledge/working experience with Great Plains, ADP and E-trade. Strong accounting experience with the ability to think through unfamiliar transactions and suggest appropriate solutions. Must be highly motivated self-starter and problem-solver that is both organized and detail oriented. High reliability and dependability must be counted on to complete assigned duties. Must be able to work independently, but also thrive in a work environment that fosters open communication, collaboration and team work. Excellent written and verbal communication skills, ability to communicate with employees at all levels. Able to adapt to changes in the work environment; manages competing demands; changes approach to best fit the situation. Results Oriented – meets commitments on time with high quality results; drive to do whatever it takes to complete tasks and projects. Professional demeanor – approaches others in tactful manner; reacts well under pressure; treats others with respect and consideration; follows through on commitments. Audit experience with a big four accounting firm, a plus.